Notes: Pink variety peonies in bulk - our choice. Prolific bloomer, producing 20 or more flowers per plant once established. Nothing compares to a peony - huge flowers, up to 6 inches across, on strong stems with lush green foliage. A cut flower without comparison, they are also beautiful in the border as a centerpiece. We have freshly dug roots in good varieties adapted to the North and Southeast. Plants take one to two years to establish. 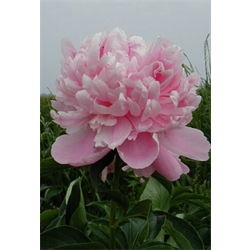 When planting these pink peonies for sale in areas with partial shade, staking may be necessary for support once blooming begins.